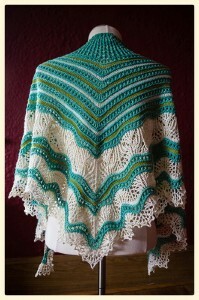 Your shawls are stunning. I love the colours! 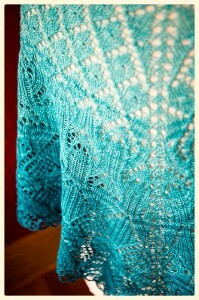 I’m on a bit of a lace shawl kick myself!! I’ve got 2 from Boo Knits on the go and a very old Sun Ray table cloth I’m going to use as a shawl. I should really cast on something simple as a pallet cleanser!! 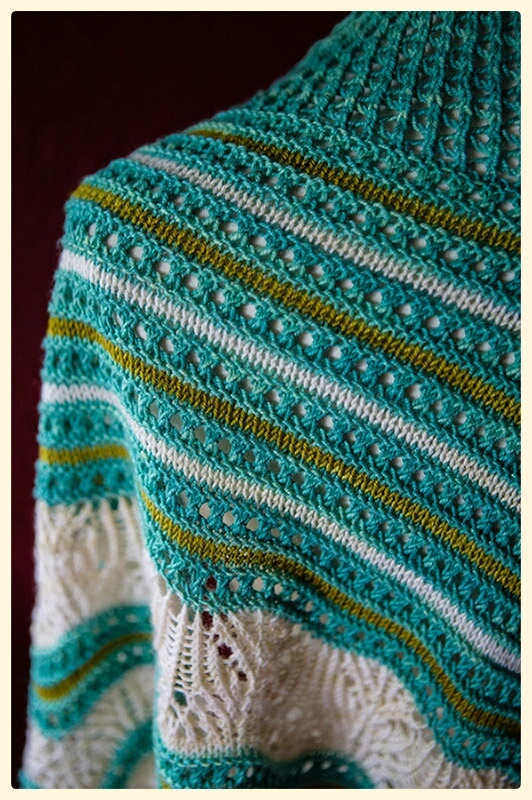 It is kind of an alternate universe to hear you extolling the virtues of Mystery Shawls, but I am SO HAPPY you decided to knit along with us. That was really fun and just what I needed. Onwards to Germinate! P.S. 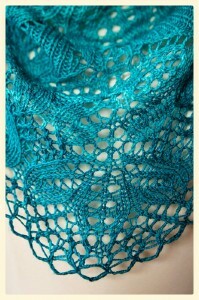 I wear my shawls exactly this way and it works great instead of a regular scarf. Beautiful! 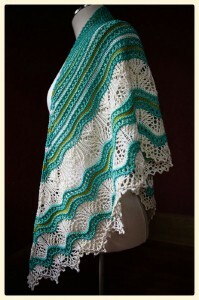 I tend to wear my shawls that way as well. 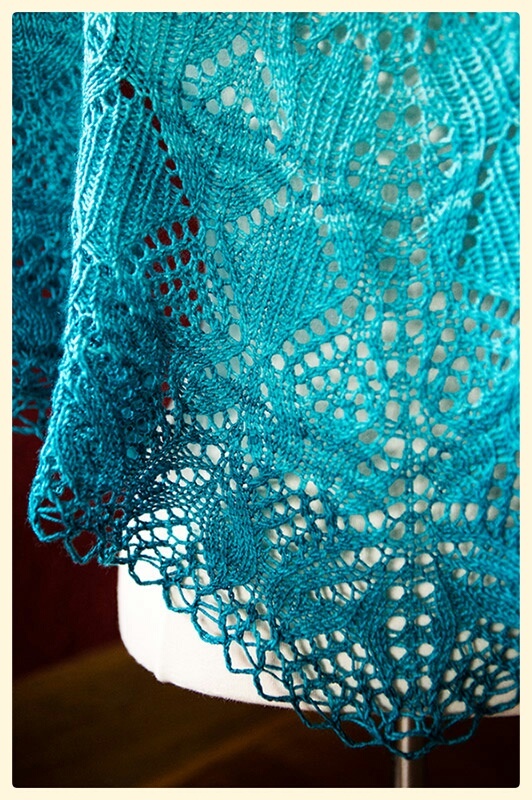 I have one of Kirstin’s patterns in the queue as well, but I really need to finish one of the other 3 shawl things I’m already working on. Love them both! Red Rock Canyon turned out beautifully with the three colors. I can’t imagine it any other way. 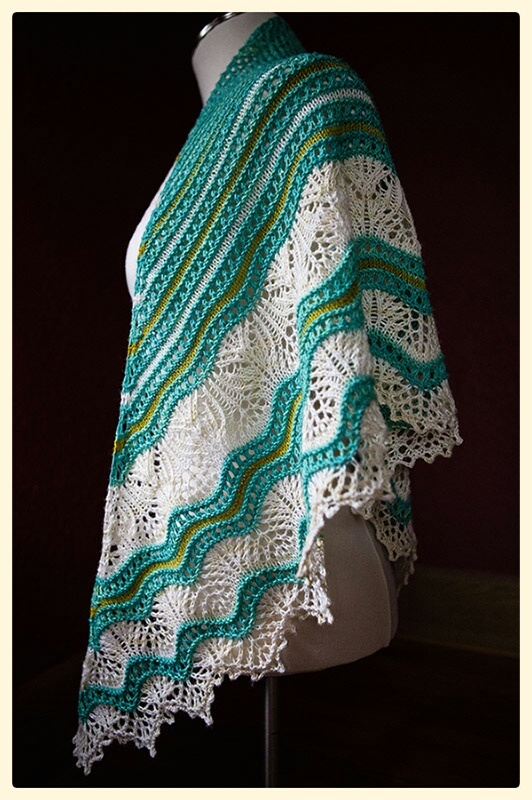 Both shawls are beautiful but I’m especially partial to the Mystery One since we all did that together. 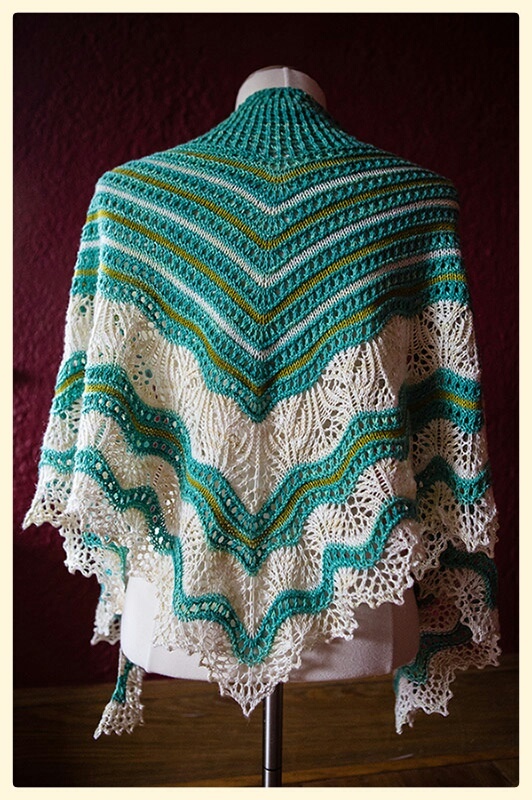 I agree with Carole above–I love how the colors look together on the first shawl, but I think the second shawl is stunning. 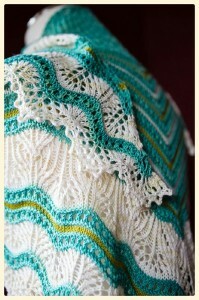 (Doesn’t hurt that that’s one of my favorite colors) and I love the delicacy of the edging. The shawl is really gorgeous! but…who will wear it? I don’t ever see women of any age with a shawl ,no matter how beautifully it’s made. Scarves, cowls (winter) are what I see. It seems wasteful. Lovely finishes. 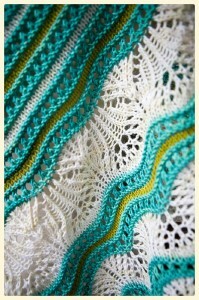 That blue ombré yarn is gorgeous!! I have been working on the red rock canyon shawl myself but fell behind at some point and haven’t yet caught up. Maybe next month! 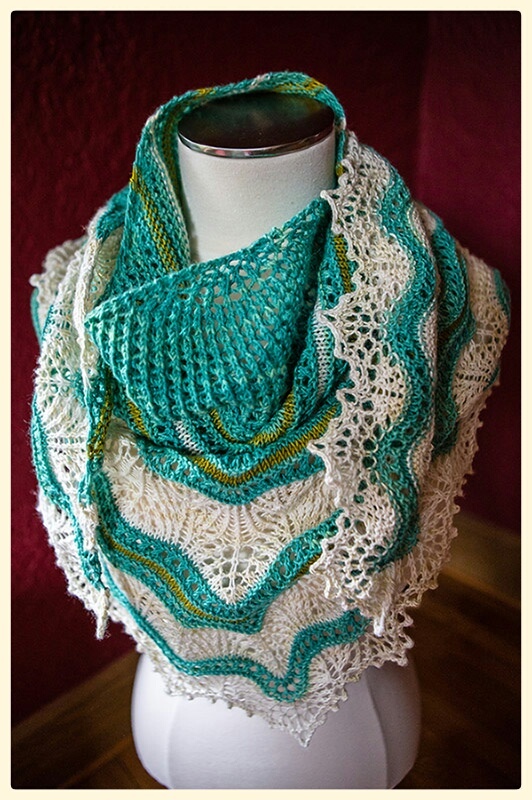 Lily, if Cara won’t wear that shawl, I definitely WILL!!! and I’m not picky – either one, or both … happily! Congratulations on your productivity! So impressive and so lovely! These are beautiful! Your reference to old time knit bloggers reminded me of when I was blogging all the time, and reading and commenting on many, many knit blogs every day. Specifically I remember a time when I really looked forward to seeing your latest pair of STR Jaywalkers. 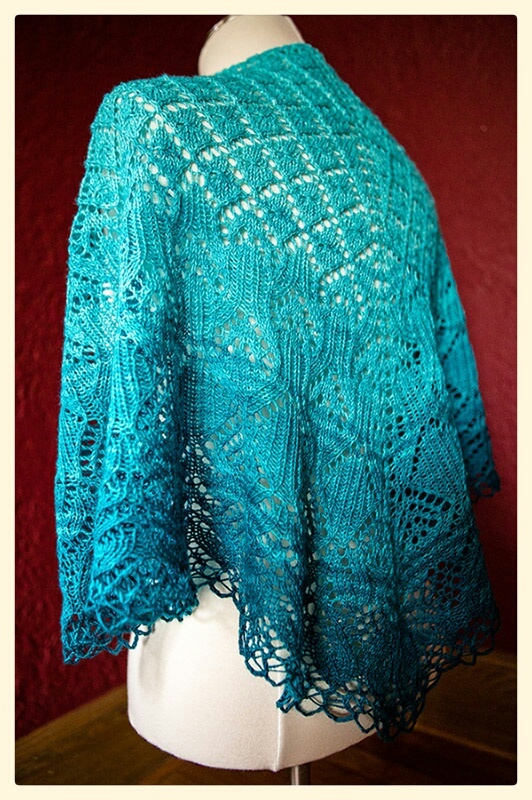 It definitely takes a bit of trust in the designer to knit a mystery shawl, and it doesn’t always work out, but I’ve not been steered wrong by either Kirsten or Romi. I love so many of their designs! 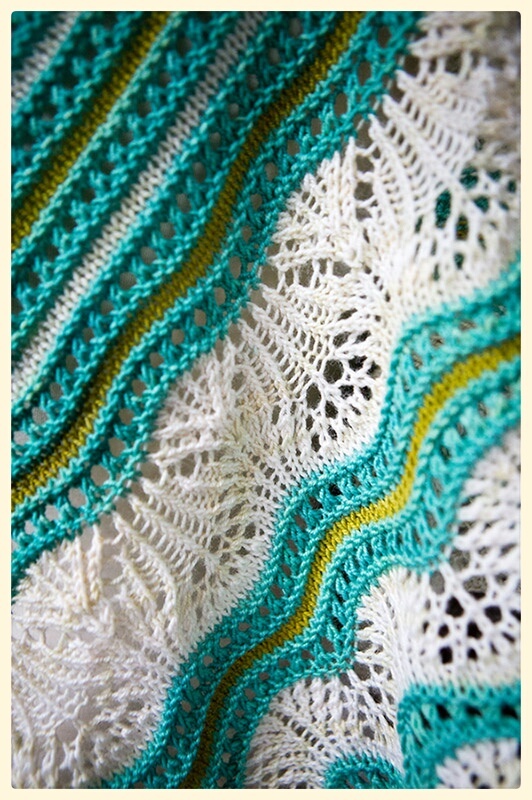 I’m loving the gradient yarns, although with a new and exciting idea comes the temptation to enlarge the stash…I rather miss the days when one could cruise around the knitbolggers’ webring in an afternoon. Too much to keep up with now. “Irene Adler” was the first lace shawl I ever knit. I knit it just before the Mystery Shawl started, and that’s when I fell in love with Kirsten’s patterns. I started the Mystery Shawl a little late & finished it last week. I love it! 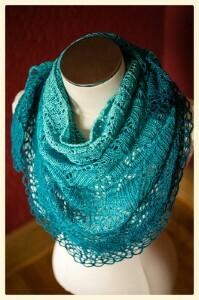 I also love the Black Trillium yarn! 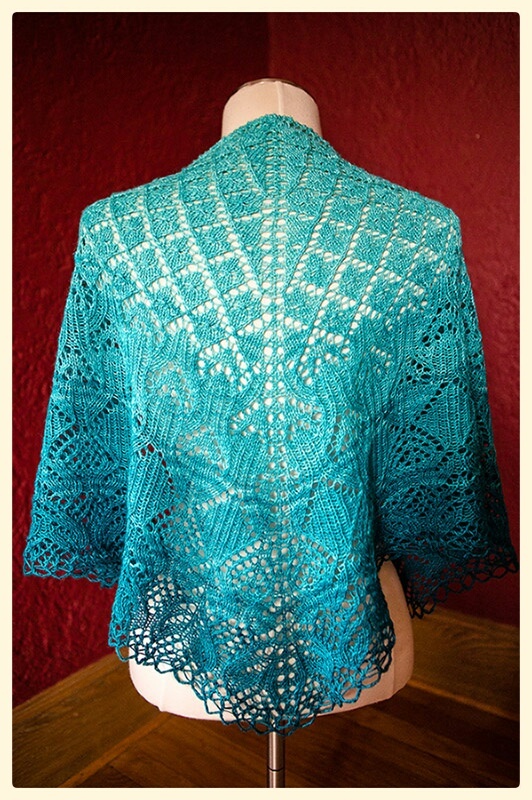 Now I’m trying to decide if I want to knit the Mystery Shawl a second time, or if I want to knit another of Kirsten’s shawls.